The Van Allen Probes will help us understand the sun's influence on the Earth and near-Earth space by studying the planet's radiation belts on various scales of space and time. The Van Allen Probes mission (formerly known as the Radiation Belt Storm Probes mission, renamed on Nov. 9, 2012) is part of NASA's Living With a Star Geospace program to explore fundamental processes that operate throughout the solar system, in particular those that generate hazardous space weather effects near the Earth and phenomena that could affect solar system exploration. Understanding the radiation belt environment and its variability has extremely important practical applications in the areas of spacecraft operations, spacecraft and spacecraft system design, mission planning, and astronaut safety. Discover which processes, singly or in combination, accelerate and transport radiation belt electrons and ions and under what conditions. Understand and quantify the loss of radiation belt electrons and determine the balance between competing acceleration and loss processes. The instruments on the two Van Allen Probes spacecraft provide the measurements needed to characterize and quantify the processes that produce relativistic ions and electrons. They measure the properties of charged particles that comprise the Earth's radiation belts and the plasma waves that interact with them, the large-scale electric fields that transport them, and the magnetic field that guides them. NASA launched the Van Allen Probes on August 30, 2012 for a prime mission of two years. Identical sets of suites of five instruments were integrated on a pair of APL-built, sun-pointing spacecraft with a perigee altitude of approximately 500 kilometers (approximately 311 miles) and an apogee altitude of approximately 30,600 kilometers (approximately 19,014 miles). Inclination will be no greater than 18 degrees. The two spacecraft will fly in nearly identical eccentric orbits that cover the entire radiation belt region, lapping each other several times over the course of the mission. 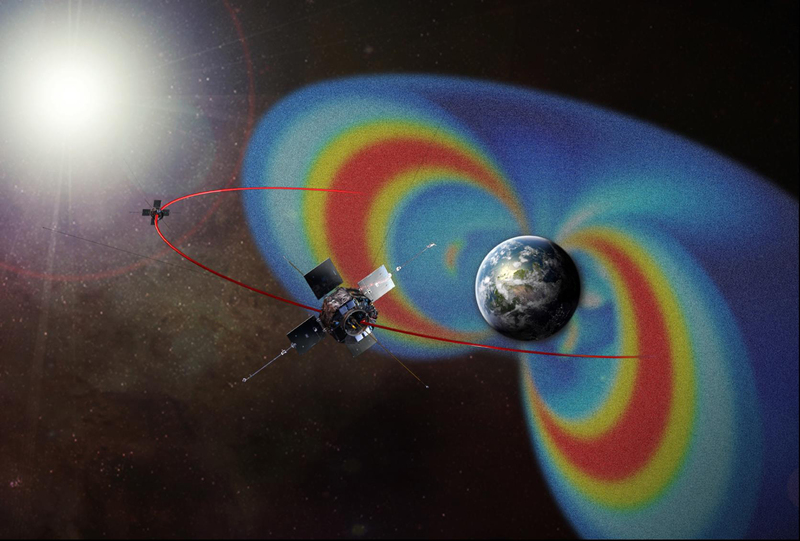 The Van Allen radiation belts are two donut-shaped regions encircling Earth, where high-energy particles, mostly electrons and ions, are trapped by Earth’s magnetic field. Many of our satellites and astronauts operate in this region of space. Geospace is the region of space that surrounds Earth. It extends from Earth’s upper atmosphere to the magnetopause, the boundary between the magnetosphere and the solar wind. What are electrons, protons, and neutrons? All matter is made of atoms, which are made of smaller particles. The nucleus of the atom is made of positively charged particles called protons and neutral particles called neutrons. Around the outside of the nucleus, in constant motion, are negatively charged particles called electrons. An ion is an atom or molecule that has an electric charge. When an atom has the same number of protons and electrons it is said to be neutral. Electrons (which carry a negative charge) are very light and mobile and can easily be torn away from an atom and rejoin other atoms. An atom that has gained or lost an electron, and is therefore no longer neutral, is called an ion. Plasma is often called the fourth state of matter, beyond the familiar three--solid, liquid and gas. It is a gas in which atoms have been broken up into free-floating negative electrons and positive ions, atoms which have lost electrons and therefore have a positive electric charge. Why is plasma more commonly found in stars than on Earth? In the lower atmosphere, an atom that loses an electron quickly gains another one. But in places of extremely high temperatures, like the sun’s atmosphere, the atoms are moving so fast and colliding so violently, their electrons are ripped off and often do not reconnect, creating a mix of fast moving ions and electrons, or plasma. Everyone is familiar with changes in the weather on Earth, but “weather” also occurs in space. Changes in the sun’s energy flow can cause large magnetic storms in the space environment near Earth. These storms can affect the performance and reliability of our technologies, and pose a threat to astronauts and spacecraft. What is the difference between particle radiation and electromagnetic radiation, and how does each affect us? Particle radiation refers to the radiation of energy by subatomic particles, such as electrons and ions. Electromagnetic radiation refers to electric and magnetic fields that travel through waves. Electrically charged particles constantly stream from the sun in what is known as the solar wind. Earth’s magnetic field normally protects us from this particle radiation, sending the particles around the planet. But during huge solar events such as coronal mass ejections, immense amounts of particles are hurled toward Earth where they can put astronauts and spacecraft in danger. Sometimes the particles enter the atmosphere where they can create the aurora, but can also cause problems in power systems. Electromagnetic radiation includes radiation many people are familiar with. Visible light is electromagnetic radiation. Other types include X-rays, infrared light, microwaves, and radio waves. X-rays are high energy and have shorter wavelengths. Radio waves are lower energy and have longer wavelengths. Earth’s atmosphere blocks a lot of the high-energy wavelengths such as gamma rays and x-rays, lets in some medium energy radiation such as ultraviolet and visible light, while radiation with large wavelengths such as radio waves have no problem moving through our atmosphere at all. What is a coronal mass ejection and why is it important to me? A coronal mass ejection (CME) is a huge eruption in the atmosphere of the sun. During a CME the sun releases billions of tons of plasma that can blast through space at speeds reaching millions of miles per hour. Charged particles from a CME can reach Earth’s atmosphere and affect communication and navigation systems, knock out power grids, and endanger the lives of astronauts that are working in near-Earth space. What is the solar wind? How is it different from a coronal mass ejection? The solar wind is the constant stream of electrons, protons, and ions that flow out into space from the sun. A coronal mass ejection is a huge explosion that can be the equivalent of 40 billion atomic bombs. What is the connection between solar events and the radiation belts? You could say, “When the sun sneezes, Earth catches a cold.” This is a good way to remember that we live in the atmosphere of the sun and when a solar event takes place, Earth and the space around it are affected. For example, during a solar event such as a coronal mass ejection (CME) an immense amount of particle radiation is released from the sun. This radiation is deflected around Earth by its magnetic field. The particles follow magnetic field lines to the tail end of the magnetosphere (called the magnetotail), and sometimes the particles are flung back toward the planet. Once inside the magnetosphere, particles can be trapped and become part of the radiation belts. How can increased particle radiation from solar storms harm astronauts and damage technologies? When high-energy particles – those moving with enough energy to knock electrons free of atoms – collide with human tissue, they alter the chemical bonds between the molecules that make up the tissue’s cells. Sometimes the damage is too great for a cell to repair and it no longer functions properly. Damage to DNA within cells may even lead to cancer-causing mutations. Ions striking satellites can overwhelm sensors, damage solar cells, and degrade wiring and other equipment. They can also disrupt signal transmissions and knock out power grids. Why does the Van Allen Probes mission need two identical spacecraft? Only with identical instruments on two spacecraft, following one after the other in nearly the same path, can we measure changes in the radiation belts over both space and time. For example, imagine that a probe detects an increase in radiation at point A. A minute later it flies through point B and detects a similar increase in radiation. Without a second probe it wouldn’t be possible to determine whether the change was happening across the entire area, or if the location of the increased radiation had shifted from point A to B. Why is it important to study the radiation belts? Investing in the research of our radiation belts can help save money and lives. Our society relies on more than 800 satellites for communication and navigation, as well as increasingly complex systems to power our activities on Earth. Understanding the radiation belts and the dangers posed to the technologies that operate within them will help us better protect our investments and the lives of the people who work with them. What questions will be investigated during the two-year primary mission? The goal of the Van Allen Probes mission is to investigate several physical phenomena involving high-energy particle increase, behavior, and loss. We want to know what accelerates the charged particles to such high energies inside the belts, and where these electrons and ions come from. How are these electrons lost from the belts? What is it that knocks them out of their normal trajectory and sends them careening into the atmosphere? We want to know how big of an area is affected and for how long these changes take place. We also want to find out how changes in the system of electric currents, known as the ring current, which flow through the same region of space as the radiation belts, affect the behavior of the radiation belt particles. How will the new discoveries about the radiation belts be applied? Observations from the two spacecraft will be used to develop models of the radiation belts. Practical models will be used by engineers to design radiation-hardened spacecraft, while physics-based models will be used by forecasters to predict geomagnetic storms and alert both astronauts and spacecraft operators to potential hazards. How much radiation is found in the Van Allen radiation belts? How much radiation is lethal? When talking about ionizing radiation (the kind that is harmful to people) of any type, the term dose is used to describe how much energy is deposited by the radiation into whatever material is being exposed. Absorbed dose is measured in units of Grays (Gy). It is a measure of how much energy per unit mass is deposited in an exposed material. Equivalent dose is the absorbed dose times a quality factor that depends on the type of radiation. It is used to reflect the effect of a dose on a person. The ionizing radiation in the Van Allen belts is mainly electrons and protons. Electrons have a quality factor of 1 while protons have a quality factor of 2. This means that protons do twice as much damage to human tissue as electrons at the same absorbed dose. Equivalent dose is measured in Sieverts (Sv). Just like the Gy, 1 Sv = 1 J/kg, but the Sv takes into account the type of radiation. How much radiation is lethal to a human being? According to the American Nuclear Society website, an equivalent does of 5 Sv is fatal to about 50% of people. An equivalent dose of 10 Sv or more is fatal to 100% of people . So, what kind of dose would an astronaut expect to get passing through the Van Allen belts? That depends on how long she is there, and how much shielding she has. Models using data from the CRESS spacecraft place an upper limit on the dose of about 11,500 Gy per year in the belts for a spacecraft with a tenth of an inch of Aluminum (Al) shielding . Assuming that total dose is dominated by proton radiation (really it is a mix of electrons and protons), that means a human being floating in the worst part of the Van Allen belts and hiding behind a tenth of an inch of Al shielding would get approximately 23,000 Sv equivalent dose per year. That sounds like a lot, but no one would sit in the most intense region of the belts for a year. In reality, an astronaut would pass through this region in a matter of minutes on her way to the moon or beyond. In one minute, that would be an equivalent dose of just 0.044 Sv. That doesn’t include the actual amount of shielding in a spacecraft, which would be much greater than 0.1 inch of AL, so the real equivalent dose would be much smaller. According to a NASA report called Biomedical Results of Apollo , the highest average radiation dose of the Apollo crew members occurred during Apollo 14. It was 1.14 rads, which is equal to 0.0114 Gy (100 rads = 1 Gy). This would be equivalent to roughly 0.02 Sv. That is the average equivalent dose for the whole mission, not just the time spent flying through the Van Allen belts. For comparison, a CT scan of your abdomen imparts an equivalent dose of about 0.01 Sv . This might have very slightly increased the crews’ risk of getting cancer later in life, but that would be nearly impossible to distinguish from the risks of other radiation exposures we all commonly encounter. It was nowhere near enough to kill them or even make them noticeably sick in the short term. Gussenhoven, M. S., E. G. Mullen, and D. H. Brautigam (1996). “Improved Understanding of the Earth's Radiation Belts from the CRRES Satellite.” IEEE TRANSACTIONS ON NUCLEAR SCIENCE, VOL. 43, NO. 2, 353-368.